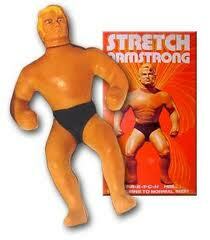 Stretch Armstrong was one of those awesome toys. He was more than a doll or an action figure -- he was kind of like a game. There were no rules that we knew of, but it wasn't difficult to figure out either. You stretched him. And stretched him some more, and usually poked him with a scissors or math compass or something to see exactly what kind of goo was inside. He also had friends. There was Stretch Serpent. An Incredible Hulk Stretch. Eventually, there was a dog, named Fetch Armstrong. There was a see-through alien guys named Stretch X-Ray. But best of all was Stretch Monster, his green lizardy enemy. They still have stretchy toys -- Whoopi Goldberg did the voice of a stretchy purple octopus in "Toy Story 3," but these were true classics. They're trying to recapture the magic with Taylor Lautner starring in a "Stretch Armstrong" movie, but that's just kinda sad. There's even a Stretch Armstrong Web site remembering the toys. He doesn't have good news for those hoping to acquire an old one on eBay, saying that only 40,000 Stretches were made, and even fewer of the weird little friends, like the monsters. But check out how many the site owner has! Was there a Stretch in your life? Just the HEAD of a stretch monster was valued at around $4500.00 on an episode of Pawn Stars. Apparently they are exeedingly rare. As I collect toys from this era, I've been looking at Stretch Armstrongs on eBay for some time (since I can't afford one). They frequently go for hundreds and sometimes over a thousand dollars when in good shape.